Having a varied and exciting journey through life has meant I’ve encountered lots of challenges, lots of different people and learned a lot of lessons. Boxing has taught me a lot. I’ve had success and I’ve made my fair share of mistakes. But I don’t hide from them, I learn from them. Failure is nothing to be embarrassed about. It’s part of life and it can be your greatest teacher. I’ve surrounded myself with people that have challenged me, they’ve supported me and I may have left school at 13 but I’ve never stopped learning. Whatever I do I give it 100%. I have big goals. Some would call me ambitious, others would call me crazy, but I know where my strengths are. I know I can make a difference. And I know that the future for New Zealand boxing is bright! From farmer, to boxer, to businessman. ​Shane was born in Wellington, New Zealand and raised in Tiniroto, a small farming community on the East Coast of the north island. His heritage is both Maori and European, his mother of Rongomaiwahine descent, hailing from Mahia and strong Scottish ancestry on his father’s side. Growing up in a rural community meant there was no local boxing club so he spent all his spare time out on the farm, but that fiery Scottish blood came in handy for his late start in boxing at the age of 19. It wasn’t until he went on his OE to England that he laced up, trained hard and had his first amateur fight. “My grandfather used to fight in the early 1930s and I always liked listening to his stories. He was even boxing on the boat when he came over from Scotland at the age of seven. He’d go running up the hills at 3 in the morning and sparring with no mouthguard, headgear or proper gloves”. That shared relentless drive and determination put him in good stead to build his boxing legacy. A few significant highlights of his amateur career include becoming number three in England in the cruiser weight division after only boxing for 18 months and winning a bronze medal at the 2002 Commonwealth Games in Manchester. 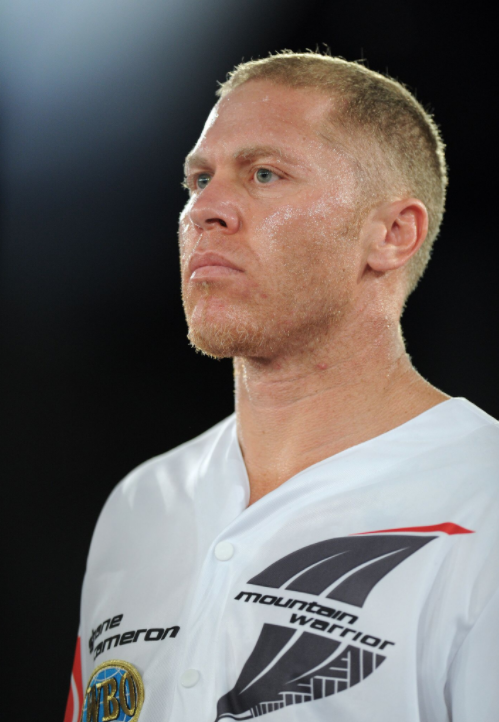 With 48 amateur fights under his belt, Shane turned professional in 2002 after the Games, kicking off an exciting professional career… The Mountain Warrior was born. Shane also won the Jamieson Belt for NZ's most scientific boxer in 2001. Fighting out of New Zealand, Australia and America, Shane quickly built a reputation as an exhilarating fighter with a good chin. Pro career highlights include sparring with boxing icons Mike Tyson and David Haye, reaching number 1 mandatory fighter in IBO and fighting for a world title in 2012. With a 34 fight history – the most significant was fighting for a world title against Danny Green. Retiring from boxing has opened up a number of business opportunities for Shane who is a firm believer that you should never stop learning. The Shane Cameron Group includes a range of entities: Shane Cameron Fitness Gym, Shane Cameron Promotions and his latest commercial venture - Counterpunch by Shane Cameron, a top quality boxing range available online and onsite at Shane Cameron Fitness. He is well known for his leadership and mentoring and is often guest speaker at various events across the country. ​NZ boxing to the next level." The Shane Cameron Foundation was founded in 2013 and aims to improve communities through educational, vocational and recreational programmes for youth. Shane has a vision to create a boxing academy to develop the next generation of boxers, providing a sustainable platform to build their careers – putting fighter welfare first. I’ve had the privilege of speaking at a range of different events and activities. I love sharing my knowledge and experience and engaging with different parts of society. I’ve spoken all over the country at business conferences, schools, awards nights, fight nights, Super 15 team building sessions, you name it. Family comes first - I love spending time with my kids and when I can, I escape the Auckland rat race and head down to Gisborne to go hunting and spend time with friends and extended family. It’s a great way to recharge the batteries and clear the head. I always come back feeling refreshed and re-energised. I find the world of business and property development very interesting. I really enjoy learning from people who have been there and done it. People who have taken risks, they may have fallen but come back stronger and smarter. I also love nothing more than seeing hard working people do well. Outside of my Foundation I often help out at community events. This year I took part in the Purple Heart Kids Day – a special day created for kids living with cancer before they head off to Camp Quality. And I’m also a long-term supporter of Paw Justice – a charity set up to help animals in need.